Don’t you hate it when you find yourself doing something you utterly abhor in others? But we digress. Bottom line is: we’re not experts, full stop. And as such amateurs, we’re not big on telling other people how to conduct themselves in their day to day living because, well, because we’re still figuring it out ourselves. Besides we are not very keen on people that tell you how you should be doing things. For example, there’s no way experts would have let the animal closest to them, the one that has 24/7 access to the inner sanctum, their own pillow and undisputed rights to the spot in front of the woodburner, develop the sort of dental issues discovered at Melody’s annual vet check up, as alluded to in last weeks blog, Living the Good Life. But we did. So on Thursday it was out with the cat cage and off to the wonderful New Brighton Mall Vets for a “procedure” that required you to sign one of those forms; you know, the “in the unlikely event of…” sort. 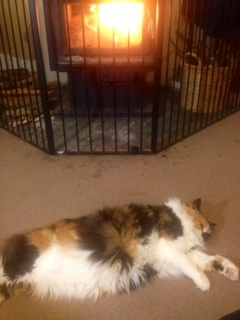 Although still decidedly wide eyed and spaced out on her re-admittance to the Homestead post-op, Miss Mel’s jumbo jet decibel purr as she stretched out in front of the woodburner last night reiterated to us humans how the two dodgy teeth and nasty gums had impacted on her happiness. Responsible pet owners would have recognised the warning signs. So, paper, scissors, rock for who get’s to check her teeth…? Neither would experts have entered into the world of duck keeping, not experts interested in keeping their footing in “The Meadow” after the kind of rainfall we’ve had recently, anyway. The newly installed Homestead rain gauge backs up our claim that it has indeed been wet for the last ten days; the sort of misty, drizzly, grey weather the goats loathe, the chickens sulk about and the cats and us humans avoid except when absolutely mandatory. The ducks, however…You know the saying, “Lovely weather for ducks”? Proven! 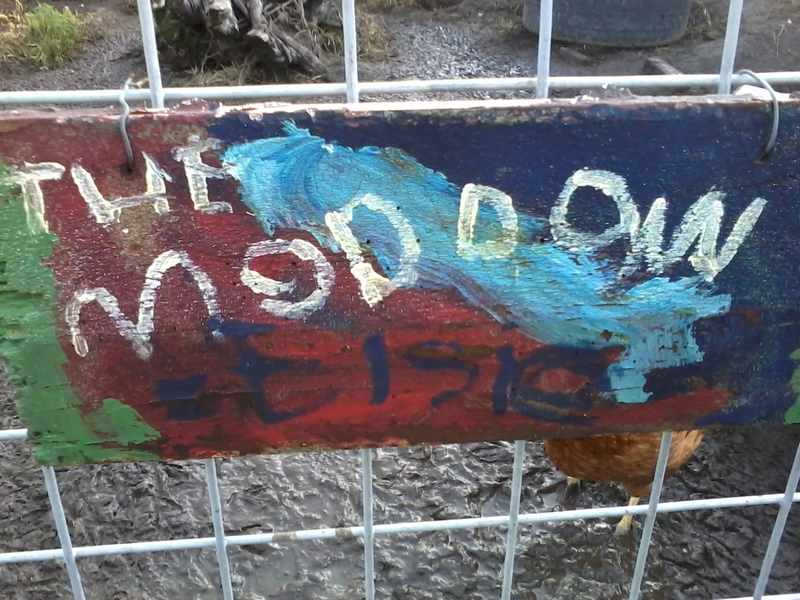 The only sound, save the distant rumble of the trucks as they ferry the foundations of another demolished home past the Homestead gateposts, has been the delighted belly-laughs as Felicity, Gwen and Hilda frolic around the mudbath that once befitted the name Farm Girl bestowed it. 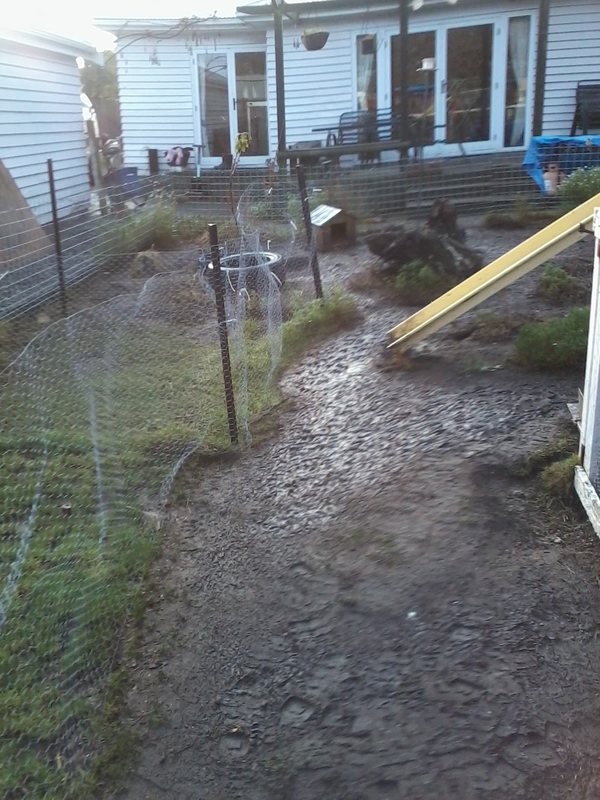 I suppose you could argue that we have become experts at keeping our footing in the newly created backyard duck wallow. We find adopting a gait combining the finesse of Torvill and Dean with the balance shift and shuffle of Mick Jagger works well. Interestingly, the involuntary noises made when this combo let us down (it is not foolproof, heaven forbid) tend to resemble the trademark “Hee Hee, Ooh” (according to azlyrics.com) of another great icon, the late Michael Jackson. Not a lot of call for this sort of expertise though. which is what made it all so much more horrific. You see, recently we hosted a dinner guest who is close enough to us to know our “buttons”; you know, those things in our collective psyche that get us a little worked up. Steamed. Peeved. This guest loves to stir the pot. He enjoys it when we get a bit irked. It entertains him. We’re not quite sure why. Preparatory discussion the evening prior outlined strategies for avoiding falling victim to his game, as we always emerge feeling slightly foolish and altogether logic-flawed. Dinner passed pleasantly: anecdotes were swapped, jokes shared, stories relayed. Coffee was taken in the living room where we lounged around in the glowing warmth of the woodburner as the rain lashed the windows. Conversation turned to garages and the mess they accumulate. “…and an entire box of plastic supermarket bags, which I am slowly sneaking into the rubbish bin,” our guest commented with a sly grin. “You don’t have to take those bags, though. You can provide your own,” one of our number commented through slightly gritted teeth. Action stations! Man the defences! “We’ve never found…” The calming voice of reason. Interrupted. It was only the gentle chuckle that brought us round. We’d done it again. We’d got on our high horse. A collective throat clearing and decorum gathering, and then The Bean Counter artfully turned the conversation to a subject close to all our hearts: The FIFA World Cup in general and our hard fought pool for the honour of the family trophy, The Smartarse Award, in particular. 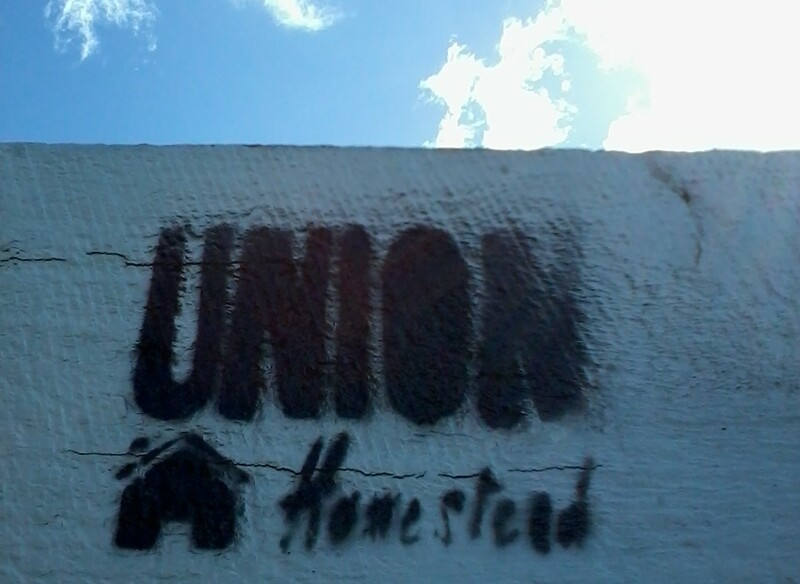 While we may not be experts, even on The Beautiful Game, the Homestead is basking in a little glory today as one amongst us got the correct result in this morning’s game. Yes! 3 points; the Homestead is on the board! As this same Homesteader has picked Bosnia and Herzegovina for outright victory, it may be a fleeting triumph but one which will be celebrated with a couple of squares of Whittakers chocolate and maybe even a glass of pinot gris. Celebrating the small stuff may just be the secret for keeping non-experts happy and off their high horses. 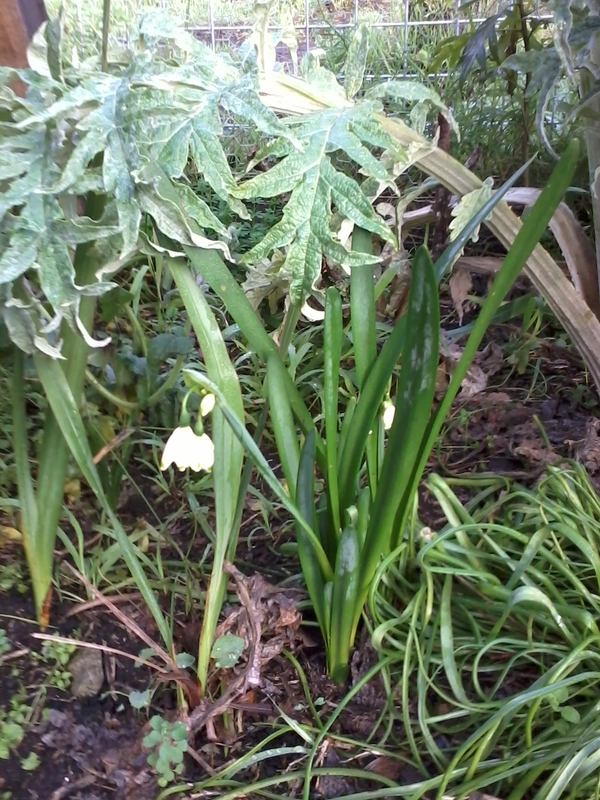 The snowdrops’ are out! All the more reason to disembark the horse and celebrate the small. This entry was posted in Ducks, Family, Garden, Union Homestead and tagged Aotearoa, Bosnia and Herzegovina, Brazil vs Croatia, Brazil World Cup, cat, Christchurch, cold, dentist, ducks, ecofriendly, experts, Family, family meals, FIFA 14, FIFA 2014, FIFA world cup, friends, gets my goat, high horse, learning, lecturing, negativity, New Brighton, New Zealand, Otautahi, plastic, plastic bags, plastic free, questioning, rain, rainy days, recycling, self esteem, self sufficiency, small victories, stirring, sustainability, the Beautiful Game, vet, Wellbeing, wet, whanau, winter. Bookmark the permalink. For obvious reasons I am only paying attention to the women’s world cup qualifiers at the moment. I am only paying attention to the NBA finals. That’s all the sports I can handle at one time.